Home A & E Fallout 4: Mutants, Lasers and Nukes, Oh My! Fallout 4: Mutants, Lasers and Nukes, Oh My! Have you ever thought to yourself, “I really want to explore a post-nuclear apocalyptic rendition of Boston, one that’s full of mutants, crazy weapons and a Fenway Park that has been turned into a city”? I certainly hadn’t, at least not until I saw Bethesda Game Studios’s Fallout 4 for the first time. Now, four years after The Elder Scrolls V: Skyrim and eight years after Fallout 3, the next installment in the Fallout series is here. And it’s awesome. The game opens right before the first nukes hit in 2077 in a world that feels like what 1940s America thought the future would be. Tube televisions, hot rod cars and old-timey terminal computers are the norm, but they are interspersed with floating robots with personalities, laser weapons and other futuristic touches. Every inch of the game oozes with this old-school futuristic style, and it really works even after nukes have wreaked havoc on the world. Your character and your spouse see on the news that nuclear war is breaking out, and you take your infant child to a Vault, a nuclear bomb shelter developed by the game’s Acme-like company Vault-Tec. You arrive at the Vault right as a nuke goes off in Boston, where the game takes place. You and your family are then promptly frozen in a cryogenic chamber. While frozen, your spouse is murdered and your child is kidnapped, and you wake up to find that 200 years have passed and the surrounding area of Boston is now known as the Commonwealth in this post-nuclear war state. From there, the game opens up and you are free to explore the huge world that Fallout 4 has to offer as you search for your son. 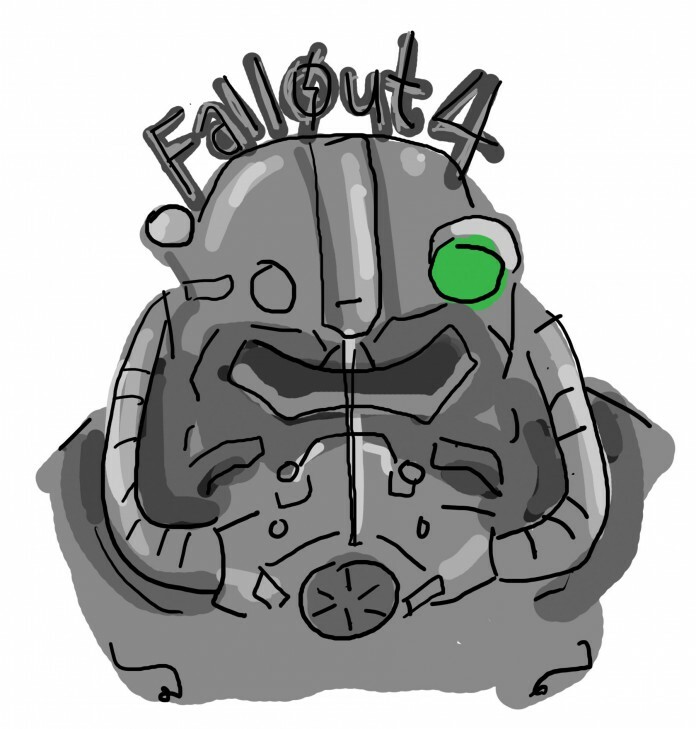 Anyone who’s played Skyrim can expect the same breadth of content out of Fallout 4. The world is massive, the quests are plentiful with lots of interesting characters and there are wonderful secrets around every corner that reward player exploration. Player choice is also a huge aspect of the game, with plenty of dialogue options and tons of weapons and specializations available to allow you to play the game as you want. Combat is also much improved in Fallout 4. If you played Fallout 3 or its spin-off New Vegas, you may recall that the shooting was, shall we say, less than stellar. Fallout 4 fixes this by playing more like a typical first-person shooter; guns actually shoot where you aim them, and each gun feels weighty and powerful. V.A.T.S. also makes a return, allowing players to slow down the action and spend Action Points to aim at specific body parts with varying levels of accuracy percentages depending on where you aim. For instance, aiming at the head may have a lower chance of hitting than, say, aiming at the torso. While it’s still great fun to obliterate people’s heads in V.A.T.S, it feels much less accurate this time around. However, this was likely a deliberate choice to help balance this system with the actual first-person gunplay. New to the Fallout series is a huge crafting system that rewards players for hoarding screwdrivers, empty pots and other junk that you might find throughout the Commonwealth. Each junk item is broken down into crafting materials, such as steel, wood, screws, etc. You can use these materials to craft weapon and armor modifications to improve your gear. There’s also a huge base-management system that allows you to use this junk to create furniture, stores and tons of other stuff so that you can essentially create your own city. It’s a huge system with a lot of flexibility for players who are willing to spend the time to figure it out. In fact, if I had one major complaint for the game, it’s that there’s almost too much stuff that the game just throws at you all at once without really easing you into it. In addition to the huge crafting system, there are dozens of perks available to you from the start of the game, and it can be challenging to decide what you want to invest your skills in. As with Skyrim and Fallout 3 before it, Fallout 4 does have its fair share of glitches and bugs, but in my 15 hours with the game, they have been very few and far between, and none of them are game-breaking by any means. In spite of these issues, you really can’t go wrong with Fallout 4. There’s something interesting to do all the time, and it’s a game that has the potential to keep you busy for over 100 hours (if you have the patience and the stomach for it for it). Whether you’re blowing up super mutants or just scavenging junk with your trusty canine companion, Fallout 4 will keep you entertained. David Wills was born and raised in Northern California and entered UCSB as a Film and Media Studies student in 2012. In addition to his work with The Bottom Line starting in May 2014, David was also an editor in the 2015 edition of UCSB's FOCUS Media Journal. When he's not researching the arts and entertainment world, he's producing videos on the side to pursue his goal of editing videos for a living, interning for various video production enterprises including UCSB's Education Abroad Program.